Best Elliptical Machine 2017 – Do Not Buy Until You Read This! Best Elliptical Machine – Do Not Buy Until You Read This! What makes the best elliptical machine and how to choose the one that’s right for you – this comprehensive guide has it all. If you are into fitness, chances are you already know what an elliptical machine is. But even if you’re not, you might have heard about it. Elliptical machine (or elliptical trainer) is a stationary exercise machine, which stimulates different kinds of workout, such as walking, running, and stair climbing. Although elliptical machines provide full body workout to a certain degree, their main purpose is, of course, cardiovascular workout. Elliptical machines have been around since the early 90s, which makes them quite a new fitness machine. How Do Elliptical Machines Work? A typical elliptical machine consists of the base, ramp, motor (or “drive”), pedals, handles, and display. Elliptical trainers are mainly driven by user’s legs, but there’s also some arm work involved. It’s very easy to operate: you just put your feet on the pedals, grab the handles with your arms, and start shuffling your feet like you normally do while walking. Same with arms – you move push and pull the handles with your arms to match the exercise pace. On some models, there is also a possibility to vary the intensity of your workout by altering the resistance, incline, and stride length. Overall, the elliptical machines are a great, fun, and safe way to do a cardiovascular workout right at your place without the need to go to the gym, while getting the same results. 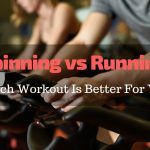 If you’re wondering about the differences between elliptical machines and classic treadmills, check this out. Here’s a list of 10 best elliptical machines available on the market. We’ll the top 5 items for a thorough review just below this table. Our top couldn’t start from a better elliptical machine than Schwinn 430. 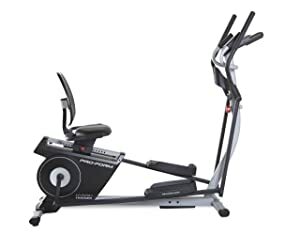 This piece of high-tech sports equipment features everything you would expect from an elliptical machine – sturdy frame, front-drive design, advanced LCD window with 13 different display feedbacks, various workout profiles (programs) and other bells and whistles. The first thing that comes to our mind when we think of Schwinn 430 is sturdiness and reliability. Yep, this machine is quite heavy (around 226 pounds), but make no mistake here – most of us would probably like our home elliptical machines sturdy and solid rather than lightweight and clunky. Despite its heaviness and length/width/height, this elliptical machine is quite easy to assemble. If you’re good on the technical side, it may take you less than an hour, otherwise, it’s anywhere from 2 to 4 hours. There are front rollers to help you move the machine around your place without scratching the floor. However, you might want to assemble it in the same room you’re planning to use it in – simply because it’s hard to move around, especially through the doors, due to this machine’s dimensions. As for the exercise capabilities, this machine does it all with ease. The wheel moves quite smoothly so there’s little to none buzz and squeaking. 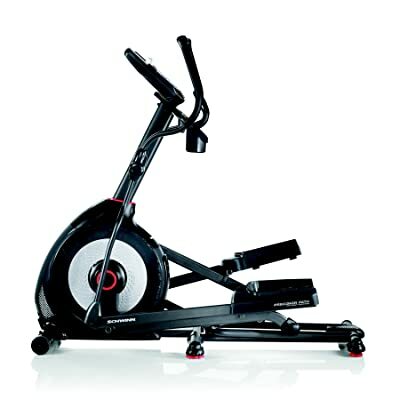 Schwinn 430 Elliptical Machine offers 20 levels of resistance, which is more than enough for most of us home athletes. Personally, We love the ability to have custom user-defined workout profiles as most pre-installed programs simply wouldn’t fit our workout style. Other nifty features include a three-speed fan and acoustic chamber speakers to make your workout really loud. “But is there anything wrong with this machine because judging by the review it looks like it’s almost perfect?” you might ask. Well, there is. First off, this machine takes up quite a lot of space and it cannot be folded for easy storage. So, you’ll have to live with Schwinn 430 Elliptical Machine as your new piece of furniture. Add the fact that’s very difficult to move. Another annoying thing is that some bolts require extra tightening, and not with the supplied Allen wrench, but rather with a ratchet wrench. In addition to that, be sure to check the bolts once a few months as they tend to loosen with time, depending on the use intensity. We’d like to write anything special about Nautilus E614 Elliptical, but we can’t, really. From a user perspective, it’s just another elliptical machine – nothing more and nothing less at the same time. 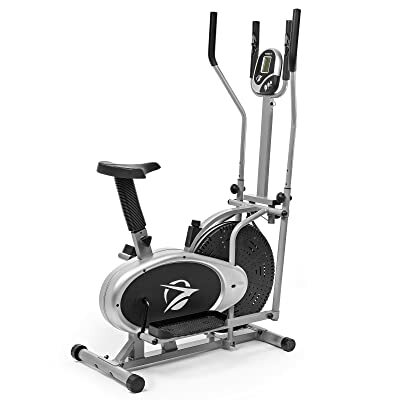 Although it looks quite similar to Schwinn 430 (these two products even share some common features), Nautilus E614 Elliptical is bleaker, and much less striking in terms of appearance. However, it’s core features that make a product good (or not so good as the case may be). Nautilus E614 does offer 22 workout programs and 20 levels of resistance, which is sufficient enough for us (anyone) as a home athlete. We like the wide foot plates with slip resistance cushioning – a true highlight for this product. We wish other models of elliptical machines were so comfortable and foot-friendly. While in the hardware department, we should also mention the DualTrack LCD window system that allows you to track your progress while reading a tablet at the same time. 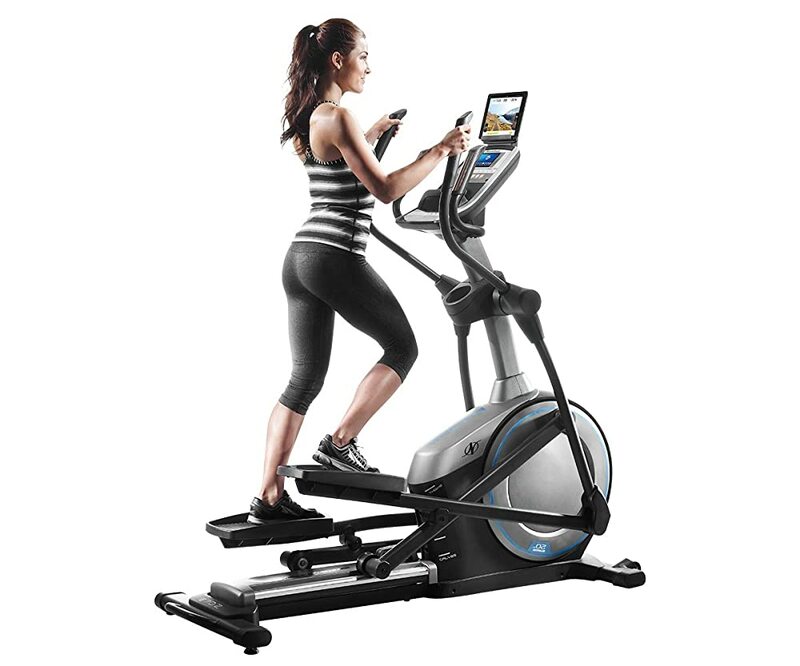 As for the software, this elliptical machine features Nautilus Connect service for data exporting and goal tracking. However, for us, it’s more of a fad than an actual feature. We are in here for the workout, not some fancy online data wizardry. It’s also worth mentioning that the maximum user weight is 300 pounds – of course, if you’re over 300 pounds, you can still use Nautilus E614, but at your own risk. Most competitors go beyond that. Another disappointing thing is that the handlebars are quite narrow for an average man. For those of you who like loud energetic workouts, Nautilus E614 Elliptical has acoustic chambered speakers. We wouldn’t say that they’re necessarily bad, but certainly not the top-notch. The heart-rate sensor is fairly accurate, although We haven’t tested it through some special equipment. As with the other elliptical machines, Nautilus arrives in the boxes in parts. However, the assembly process is nothing too complicated – an average user can do it within an hour or two. Some people report ear-piercing squeaking after a few months of use, but it’s hard to say if it’s a “feature” or just some one-off manufacture faults. And yes, the price – for such a generic product, it’s way high, in our opinion. 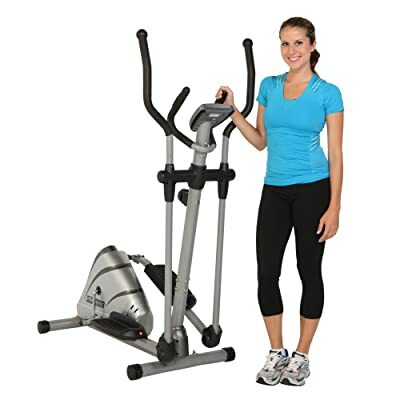 Overall, Nautilus E614 is a generic elliptical machine at best. For the amount of features and build quality. This machine is worth for what you get. Exerpeutic 1000Xl is a perfect design workout machine. The design helps to improve strength and tighten your lower and upper body at the same time. It offers 8 level magnetic tension resistant for heavy duty workout time. There is a large LCD display for showing you the performance data. You can see the calories burned, distance, speed, and time and target zone. In order to monitoring heart rate, there is an additional stationary handlebar too. So, it helps to show you accurate pulse rate. The dual action workout arms will increase the power of your hand muscles. Moreover, the workouts will not leave any impact to your lower back. So, there is no risk of injury too. This is easy to use and do workout machine for any person. The elliptical machine has a 300 lbs weight capacity. So, any person can use the machine for the workout. It has transformational wheels for moving easily. Moreover, the wheels are lockable for stability during the workout. It addition, it ensures safety with larger pedal designs. So, this will keep you safe and give you a good result. However, you will need to assemble the elliptical machine. This is not easy for any beginner. You need some skills to assemble the machine. Moreover, you can’t take larger steps because of the length of the stride. It offers 8 levels of magnetic resistance for having a challenging workout. Good design without any bouncy movement that causes injury. The LCD display shows many data. You can track your goal progress on the screen too. There is an extra handle pad for monitoring your heart rate. Offers quiet and smooth functions to the users. Easy to move to anywhere with dual functional wheels. 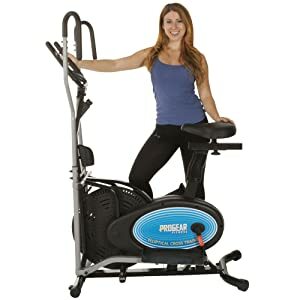 This is an excellent workout machine for the people who are looking for affordable fitness equipment. This is a suitable workout machine with standard features to give you challenging workouts. Moreover, it only helps to reduce weight but also can keep you fit. This is an ideal workout machine to workout at home. 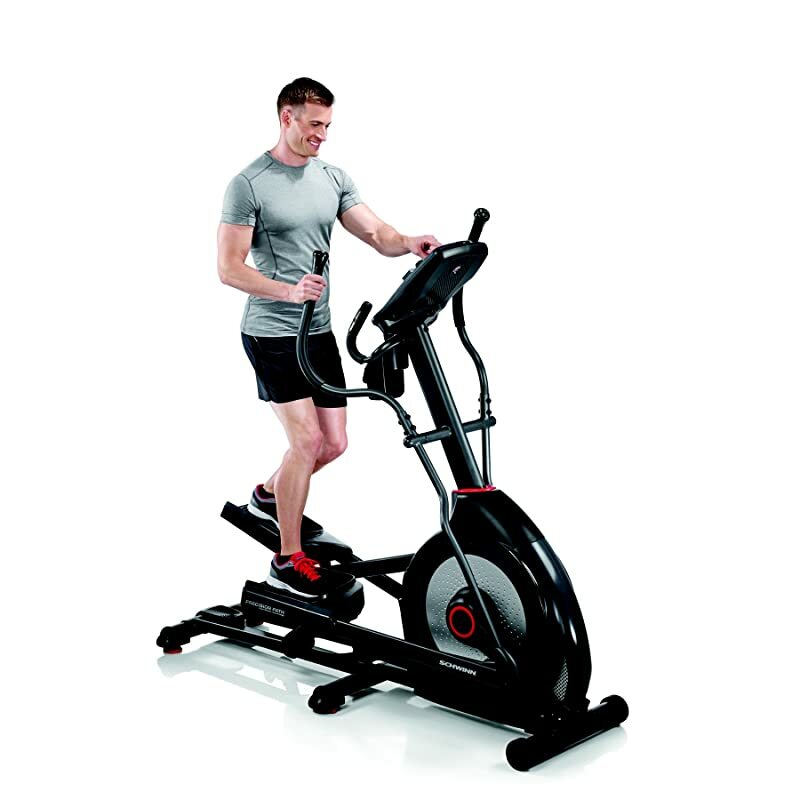 Schwinn 470 elliptical machine is one of the best workout machines for home. This is a functional and easy to use the elliptical machine for any beginner. It comes with automatic incline system when doing a workout. Moreover, it offers 25 levels of resistant aligned to improve maximum workout. The computer system of the elliptical is impressive. Two LCD window systems show you 13 different display feedbacks. You can select pre-programs from 29 programs or transfer any new program using USB port. The best part is having a goal setup and tracking feature. You can always monitor the performance and improvement towards the goal. The manufacturer also provides extra-large crossbar tubing for increasing stability. To keep you entertained and cool, the machine also offers a 3-speed level fan and acoustic chamber speakers. Moreover, the handle is designed ergonomic friendly because it will sense to showing the data on the screen. The elliptical machine offers fixed stride length. It offers up to 20-inch stride length. But, most of the elliptical machine offers an adjustable feature for all people. The shorter people will find trouble to use the workout machine. In addition, you need to buy heart strap monitor separately. So, it will increase your cost too. 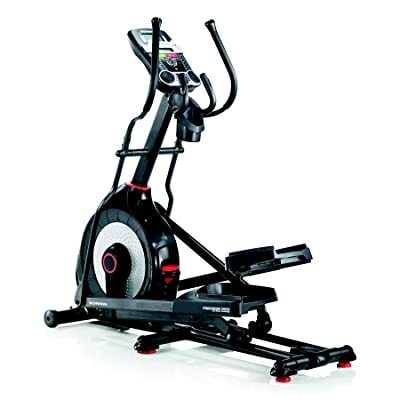 The Schwinn 470 offers 25 ECB (Eddy Current Brake) resistant settings and automatic incline mode. The resistant settings are easy to adjust smoothly using your fingertips. It comes with dual track two LED window systems for workout performance. You can see data on the display. This is a quality mid-level workout machine for the people. 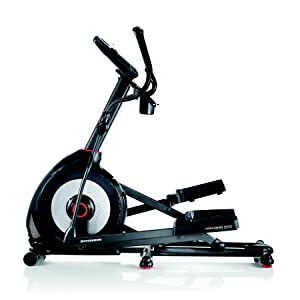 There is no doubt that Schwinn is a strong company to provide good workout machine. The automatic incline system is the best in this model. This machine can customize and setting workout for multi people. Ideal workout machine for home. Proform Hybrid Trainer is an unusual elliptic trainer for a number of reasons. First of all, its capacity is 350 pounds which is not something every elliptic machine manufacturer offers. For those of us is over 300 pounds and is bound to lose some of those pounds, this machine may be a good choice. Secondly, it has two available workout positions: seated and standing (hence the name “hybrid”). That’s quite versatile, to say the least. And finally, it features a magnetic resistance mechanism, unlike cheaper models. This silent magnetic resistance (SMR) mechanism allows for a smooth and quite quiet workout. Proform Hybrid Trainer is a mid-range product. Sure, there some bells and whistles, but mostly it’s basic functionality you would expect from any similar elliptical machine. Proform Hybrid Trainer features a 15-inch stride, target pacer, adjustable foot pedals, and water bottle holder. For those who like their workout hard, there are 16 levels of resistance which is a bit less than more expensive competitors can offer, but still sufficient enough for most users. The transport wheels are a good addition because you obviously wouldn’t want to drag this 135-pound machine across your room. EKG grip pulse works just fine measuring the pulse to ensure a safe workout process. 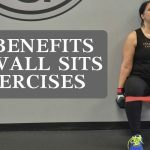 Despite what we’ve said in the beginning, the two-way exercise option (seated and standing) may not seem such a good idea. Sure, there’s nothing wrong with working out on this elliptical machine in the standing position. Those of you, who tried both seated and “standing” versions of a stationary bike, will probably know exactly what we mean. It’s not a bad thing by itself, but still feels kind of unnecessary to our. The 5-year warranty that comes with Proform Hybrid Trainer elliptical machine is reassuring, considering the mid-range build quality. You may expect a few squeaks here and there after some time. Proform Hybrid Trainer does a good job at combining the two workout options in one product, along with some other must-have features. The price seems right too. Highly recommended. 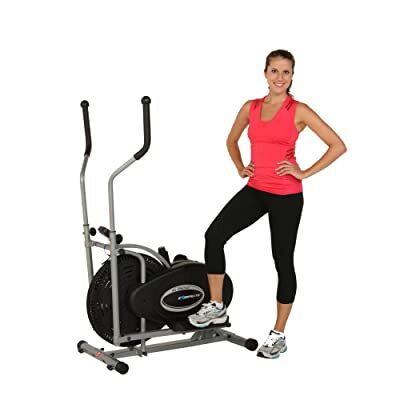 Do you want to buy a starter level elliptical trainer? Then, this is the most suitable beginner’s trainer. 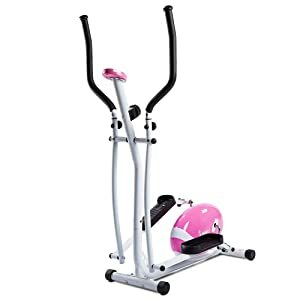 This is an affordable and easy to use workout machine for the women. This is designed with 8 levels tension controller for giving good workout result. In addition, it supports your body fitness, burn more calories and gives enough strength. It has a monitor that shows much info regarding your workout. You will get speed, distance, time, total distance and calories burned. As a result, you do not need to count anything for tracking your workout result. The information will show on the screen. The machine comes with anti-slip platforms to prevent injury. In addition, this is lightweight but provides stability during the exercise. As a result, you don’t need to fear to lose balance. Don’t worry about assembling the trainer because this is very simple. This will not take more than 20 minutes to assemble. The manual instruction is enough to assemble it properly. It can support up to 220lb weight. Easy to track the performance. The anti-slip platforms make it safe for doing working. The machine is not suitable for doing exercise at high speeds. This is a perfect and suitable workout machine for starter women. In fact, the workout machine is a good option to use for women at home. This is reasonable priced machine and offers good levels of getting a good result. Although this is not suitable for taller people, this can improve body strength, tighten the muscles too. It’s a highly compact and “no-frills” exercise machine which, nevertheless, retains most of the features of its “bigger” analogs. From the first glance, Exerpeutic Aero Air may not seem like something that was built to last. OK, probably from the second and third look too. But if you take the price and the little amount of space it requires into account, things will start to look brighter. 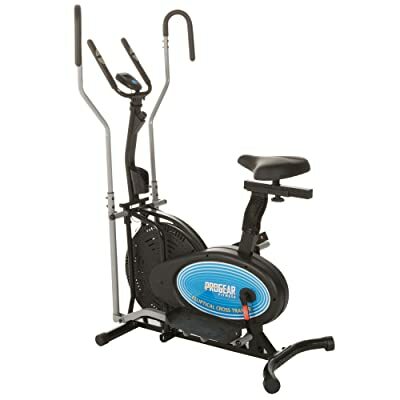 Speaking of the product itself, this elliptical machine features adjustable strap tension a simple workout computer. The foot pedals are quite small but firm and sturdy. Workout arms are nothing special and do their job just right without providing any discomfort. Every time I use this Exerpeutic Aero Air elliptical machine, I can’t stop feeling ripped off yet there’s not a single major flaw with it. However, if you take a look at the official product page on their website, the phrase “we offer high-quality products at value-oriented prices” says it all:). The price is indeed value-oriented, as there is no other product in this price range that can give you the same satisfaction. Yes, the display looks like it’s from the 90s and the strap tension system is quite outdated, but they all somehow seem to work quite nicely. One thing that you’ll definitely love about this product is that it’s super-light and super-compact. Weighing only 55 pounds, Exerpeutic Aero Air can be easily carried around. Due to its modest size, this elliptical machine will fit in any room without taking up too much space. And price – It’s cheap, you can get yourself a decent elliptical machine and do cardiovascular workouts with no hassle right out the box. The downside to this otherwise great product is the quality. Well, they must have saved on something – and that something is the build quality. Expect some shakiness, loose parts, and squeaking, although it does depend on the batch. Exerpeutic Aero Air is a great, no-frills elliptical machine, designed for serious exercising. It’s unbeatable at such price. This is another two-in-one workout machine for the beginners. 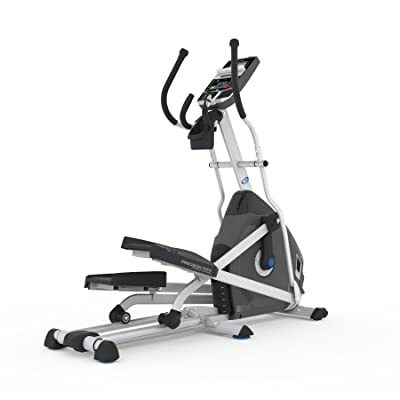 The fitness machine comes with both elliptical trainer and exercise bike design. Therefore, you will get full body workout from the fitness machine. This is made of steel and offers full stability for a workout. The tension is easy to adjust in the fitness machine. So, you can increase or decrease the tension level during the exercise. Moreover, it leaves minimal impact on joints. You can feel safe enough to do exercise. You will also get an electronic console panel. The panel will show time, distance, calories burnt and other data. Most of the fitness machines don’t provide seat adjustable feature. However, this machine offers easy to adjust seat height. So, you will feel normal doing the workouts. But, the seat is hard that may not comfortable for most of the users. This is not a suitable fitness machine for the people who are more than 6ft tall. Stride length is not perfect for those people. On the other hand, this will create noisy when running the exercise bike. Therefore, you can’t enjoy watching TV when doing the workout. You will get a high-momentum fan in the machine. It will prevent you from sweating. As a result, you can continue doing a workout for a long time. In addition, you will get slip resistant handles for safe workout time. The elliptical machine is affordable and perfect for the beginners. It offers various workouts for getting a good result. Moreover, it does not have any effect on your joints. 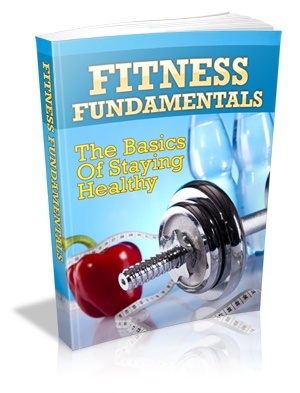 As a result, you will feel comfortable to do any type of exercise for remaining fit. Make sure you are not more than 6ft to do the exercise properly in the trainer. Another hybrid in our top, ProGear 400LS 2 looks like it’s a breed of the previous two models. 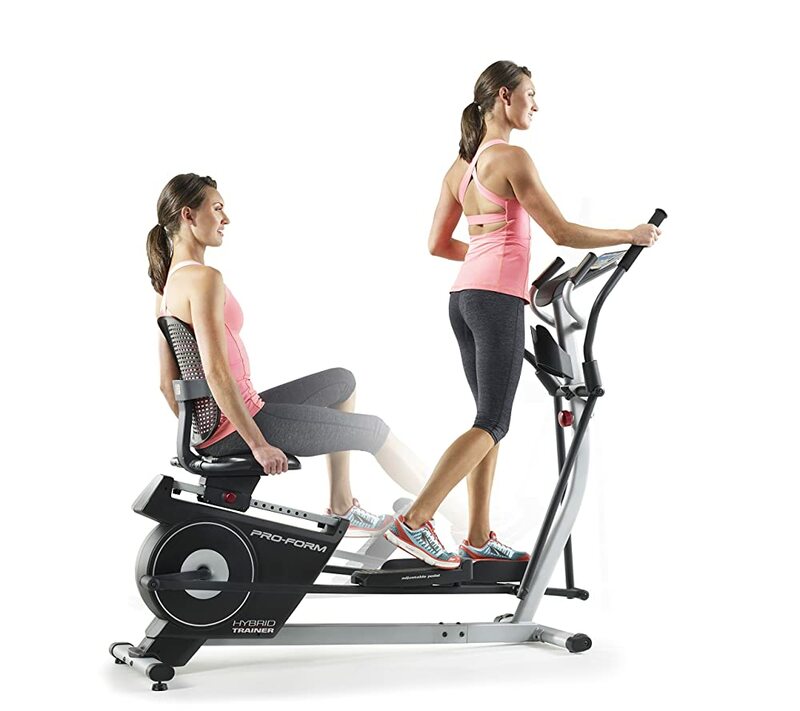 Exerpeutic Aero Air donated its compactness, price, and light weight while Proform Hybrid Trainer gratefully shared its hybrid approach with two-way workout position: seated and standing. Jokes aside, ProGear 400LS 2 is actually more serious than it looks like. It means business. It wants you to do your workout and go home (well, you are already at home so what it probably meant was “don’t expect anything fancy from us”). This elliptical machine allows up to 250 pounds of user weight which not bad, but far from impressive. It has 14-inch stride with backward stride capability which is quite handy sometimes when you get tired of moving legs in the same direction all the time. Such a short stride may seem uncomfortable to some athletes, but that’s what you get. As for the workout itself, there’s nothing to complain about, really. It’s quite easy to switch between seated and standing position, however, the seat will still get in your way sometimes despite what the glossy ad says. The seat can be adjusted in 4 directions so it won’t be a problem to find the most comfortable position. Simple LCD display shows all the basic information you may need: elapsed time, calories burned, heart pulse, speed, and distance. ProGear 400LS 2 does not take up a lot of space and can be easily transported using the transport wheels as shown in the ad (and that is actually true). One-year warranty, though, seems a bit redundant as if like manufacturer expects this elliptical machine to deteriorate after one year passes. Hopefully, it won’t. As with many low-end models, you may expect some problems after a few months of usage. The most common are squeaking moving parts (usually fixed by excessive oiling) and damaged/broken tension belt (happens quite rarely though). Not exactly a bang for the buck, but pretty close – ProGear 400LS 2 offers a hefty amount of features for a little less than cost. We would say that it’s a bargain alright. Do you want to buy an affordable workout machine? This is a two-in-one workout machine for beginners. It comes with seated exercise bike design with an elliptical standing position for better workout result. It will help you for low impact workout and full-body exercise. 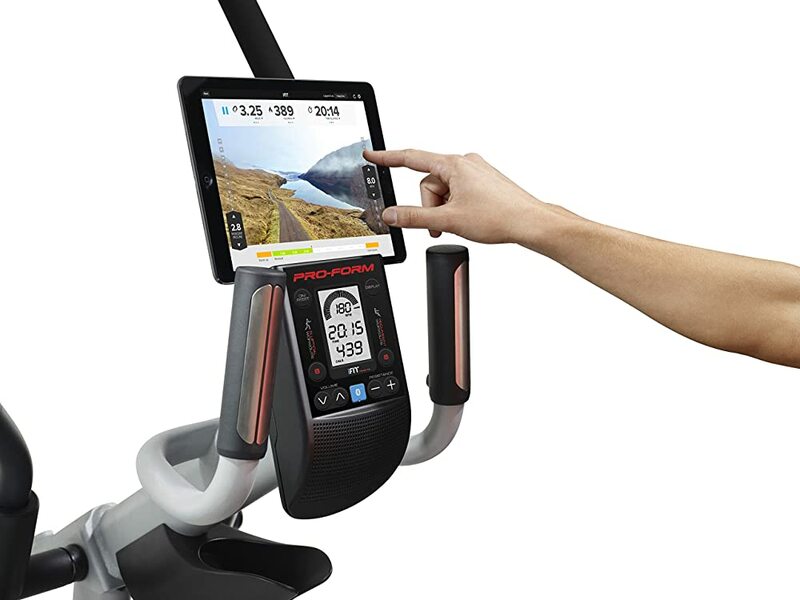 The exercise machine offers multifunctional LCD digital display console for the users. The display window will show you speed, distance, time and calories burned. So, this is very easy to see goal progress on the screen. Moreover, the handles can change the elliptical machine into a stationary position. You will get also adjustable resistance level in the machine. As a result, you can increase or decrease the tension level for challenging workout time. This will give you full body workout opportunity including legs, arms, buttocks and abdominals. You need to assemble the parts of the elliptical machine. This is important to assemble the parts properly to work properly. However, assembling is not easy for any person. This will require a long time to assemble. Moreover, you may need a professional to assemble it properly. The exercise bike is easy to use. However, this creates noise a bit. This can be a disturbing when doing exercises. You can move the exercise bike easily because of the wheels. They are comfortable to move. The exercise bike seat is comfortable. You can spend hours for doing exercise. Moreover, the handle grips are slip resistant. As a result, there is no chance to slip. In addition, the large foot pedal is safe for doing exercise. The design is perfect for the beginners. This is a complete exercise bike for the beginners. This is affordable, stable, efficient and home-suitable exercise bike. The two-in-one exercise bike design enhances the quality and opportunity to do a wide range of exercise at home. Therefore, this will always ensure good full body workout without any injury risk. Although this is a bit noisy, you will feel comfortable to do exercises daily. What makes elliptical machines different from other types of cardiovascular workout machines (such as treadmills, for example) is that they offer a “low impact” exercise routine. It means that there’s less chance you may hurt your joints than with regular running. The elliptical machines reduce the stress in your muscles and tendons while exercising simply because your feet are literally stuck in the same position during the whole workout. Unlike running, exercising on an elliptical machine does not suggest jumping and landing on your feet with the weight of your whole body, which can cause some unnecessary stress to your joints. Therefore, it’s considered less harmful for an average athlete, especially if he or she is overweight. The elliptical machine used for body training and fitness are assigned different names by different users. While some refer to them as X-trainers or cross-trainers, others know them as elliptical trainers. In this presentation, we take you through each of the benefits. Training with the machine helps you gain gradual hip motion, especially following ACL surgical processes. Remember to adjust your exercise intensity depending on the level of your injury for effective results. With the elliptical machine, you work your upper and lower body simultaneously as your arms, back, shoulders, chest, and legs are involved in the exercise. What’s more, the machine allows you total body workout within 25 minutes owing to the machine’s movable handles. Reverse strides a form of workout supported by the elliptical trainer. When using the machine, you can stride in reverse. Reverse strides have the impact of different muscle group activation, support for a variety of adjustable mid-workouts, as well as greater hamstring coordination and quadriceps utilization. Elliptical training is preferred over other exercise modes as it targets weaker body muscles. Your external hip muscle, for instance, is subjected to greater activation through elliptical training. This is accompanied by lower hamstring activation. The elliptical machine is certainly your ticket to mimicry of various exercise types. This is true as the elliptical trainer allows you to mimic running, walking, jogging or climbing multiple level staircases with different intensity and resistance levels. With the wireless equipment for pulse control, your progress and speed are virtually monitored. The machine further automatically adjusts your exercise intensity depending on your pulse for comfortable exercise levels. With the elliptical trainer, you do need to worry about physical space. The trainers are designed to occupy minimal space. This is illustrated by the Stamina In-Motion Machine whose design allows for placement in the corner and the FitDesk Trainer for under-the-desk placement. Research published in the Harvard Health Publications has revealed that a 30-minute exercise on the elliptical trainer allows your body to burn an amazing 400 calories. While this is true, it gets better for people with more weight as they can burn even more weight within a similar time-span. Coupled up with your workout intensity, the elliptical machine is your perfect training and fitness machine. This benefit better serves people with joint and bone conditions including arthritis, osteoporosis, and ligament tears. 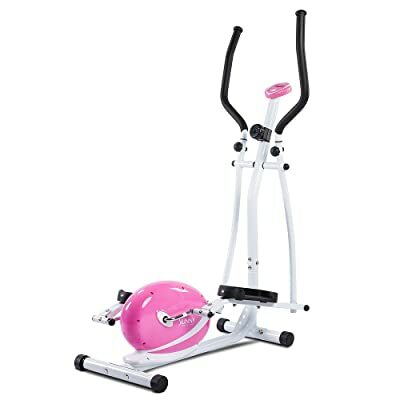 The elliptical trainer lets the trainer’s body to easily emulate a running motion without unnecessary strenuous impact on the joints as the feed remain still on the gliding surface. If you are eager to watch the latest show on TV or get done with an interesting novel, the X-trainer will be your perfect choice. Some elliptical training machines are actually designed with speakers. Thus you can play audio-books or music as you work out. All it requires is you setting your preferences on it as determinable through your daily schedule and letting it complete its tasks. Before you even start shopping for an elliptical machine, you should consider these things first. 1. How Much Do You Weigh? Does Your Physical Condition Allow You To Perform High-Intensity Cardiovascular Exercises? This actually makes a lot of sense since many elliptical machines have limited maximum user weight. Usually it’s 250 pounds, however, some models provide up to 300 or even 350 pounds of weight capacity. There is no need to wear the equipment down faster than it should. If maximum weight is important, then your physical condition is even more so. Fitness has always been about health, not some outstanding results. Be sure to consult with your personal physician before going out to buy an elliptical machine. This way you will know how many workouts you can take. Be smart – be safe. 2. 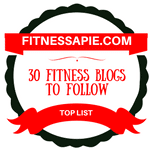 Where Are You Going To Put Your Elliptical Machine? Most elliptical machines are quite compact (the big dimensions are probably 70″L x 30″W x 70″H), which means they would fit nicely in an average room. One thing to be aware of, though – elliptical machines usually cannot be folded for an “easy storage,” so prepare to embrace the fact that your elliptical machine will become a part of your furniture. If you have a basement, this would be an ideal place for the machine. 3. Are You Able To Handle The Assembly Process On Your Own? All elliptical trainers arrive in boxes, completely (or partly) disassembled. The manufacturers provide their customer with the assembly instructions and required tools, however, it may still prove challenging for you. A typical elliptical machine assembly takes up anywhere from 1 to 2 hours, some sophisticated models may eat up a few hours more. If you’re not too good on the technical side of things, be sure to invite your friend to assist you. In our humble opinion, these are the absolute crucial features to look for when buying this device: an adjustable incline and an adjustable resistance for training versatility, smooth motion and natural movement for proper exercise, as well as quiet operation, electronic adjustability for ease of use and great tracking workout to achieve goals. If you’re just a beginner and want to acquire some general body strength, you don’t have to spend much on some fancy features you probably won’t ever use. Go with the cheaper products that offer core functionality (one-way, standing position workout) with no frills. If you’re a seasoned athlete and want to lose your body fat to get that lean look, you should probably go for the elliptical machine which provides a large variety of workout profiles and programs (including user-defined custom profiles) to fit your workout regime. If your goal is to lose weight, choose a mid-range with two-way workout option (standing and seated) as it may be difficult for you to do long (30- to 40-minute) workouts at first. Remember: your goal is target heart rate, not the speed. Fat usually starts to burn at low to average speeds. If your goal is moderate day-to-day cardiovascular activity, you should probably go for the quality and choose one of the high-end models. Consider this as an investment in your healthy body. 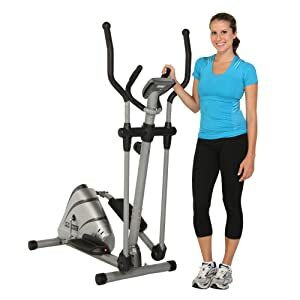 Depend on your budget, you will get a perfectly-built, sturdy, and reliable elliptical machine which will have all the features you may ever need. Plus, am extended three- or five-year warranty may also come in handy if anything happens. 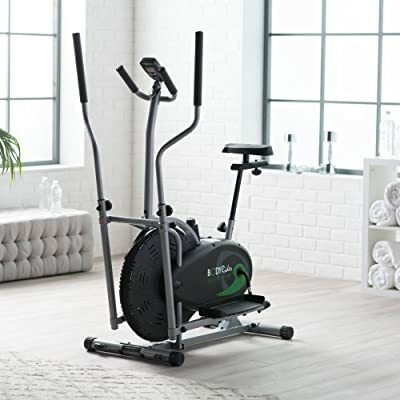 Decent elliptical machines start from around hundreds dollar per unit, while some of the high-end models can cost as much as thousands dollar. Before ordering an elliptical machine online, pay a visit to your local sports equipment store and see if you can try out some of the options you’re considering. Such products as fitness trainers are quite personal and you’ve got to realize that it’s worth investing in before actually buying it. Brands are mostly irrelevant – make sure you know your requirements and the elliptical machine of your dream will roll just right in. For more tips on how to get the maximum results from your elliptical workout, check out this article. Elliptical machines are a great and fun way of exercising your body without giving any unnecessary stress to your joints, muscles, and tendons. Without much hassle, you will a full-body workout, with an additional focus on leg muscles. 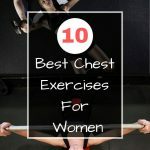 It’s especially useful for women, elderly people, and those who are overweight because the construction of elliptical machines suggests low impact training. Your feet and body in general are safely secured. Elliptical machines are relatively easy to assemble. They are usually lightweight and have front rollers, meaning that you can move these machines around your place simply by tilting them. So, if you don’t feel like going to the gym every time you need to do a cardiovascular workout, elliptical machines are a perfect solution. Good luck getting yours!